The Telecaster 4 way wiring mod provides the extra option of playing the neck and bridge pickups in series together as well as retaining the much loved traditional 3 way wiring. To achieve this, you need to replace your 3 way switch with a 4 way version and be prepared for some minor modification to your neck pickup. The newly added third wire to the neck pickup effectively grounds the metal casing to the main circuit - when the switch is in position 4, the neck and bridge pickups are playeed in series which offers a distinctively fuller tone. The 4 way Tele mod just provides that little bit extra to what is already one of the most versatile guitars on the planet! 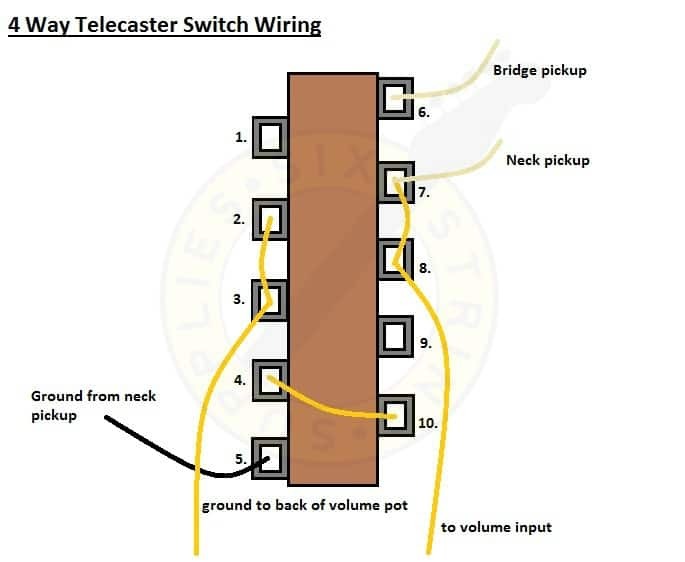 4-Way Telecaster Wiring Diagram (read our guide on the 4 way Tele wiring mod).